Are you unsure of which roofing sheets are the best fit for your project? Are you uncertain of which fixings and flashings you'll need with your metal roofing sheets? Speak to our team online via the live chat in the lower right hand corner or call 01295 565 565. We will help you pick the right sheets for your project and will ensure you have all the roofing materials you will need. Metal roofing sheets use high quality steel to offer superb strength while remaining lightweight. These steel roof sheets are still easy to install for both skilled tradesman and DIYers on a variety of roof types. 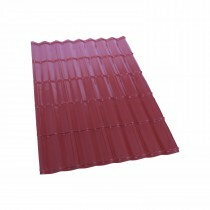 Roofing Megastore stock metal roofing sheets from various leading brands. 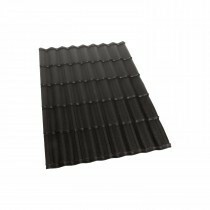 These include Britmet and Corotile, plus a range of our own brand corrugated metal roofing sheets. 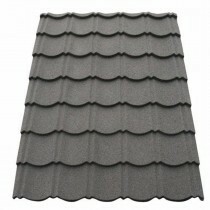 These brands craft sheets in a variety of profiles, such as a classic pantile. Unlike traditional tiles, you can therefore achieve a tile-effect without difficult installation with steel roof sheets. They also offer brilliant longevity with our range of metal roofing sheets offering up to 40 years guarantee. Amongst our range of metal roof cladding are those that can be made to measure. This allows you to choose a length that maximises coverage whilst minimising wastage. This also makes it incredibly easy to source a sheet that is suitable for your existing batten spacing. Have Questions About Our Metal Roofing Sheets? If you have questions about our range of roofing sheets, speak to our team by telephone or via the online chat. With over 40 years of experience in roofing, we'll help answer your questions about sheet roofing. We will also help you pick the necessary fixings and flashings for your project. 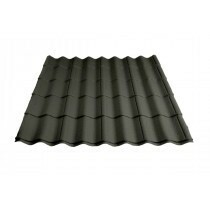 You can also view all our roofing sheets here, which include tile effect sheets. What is the Life Expectancy of Metal Roofing Sheets? Metal roofing sheets typically offer in excess of 40 years life expectancy. Britmet's range of profiled roofing sheets also provide a 40 year guarantee, providing you with added confidence in your choice. Do I Need a Membrane With My Metal Roof Sheets? Moisture may form beneath your metal roofing sheets if your roof space is not well ventilated. To overcome this, many of our metal sheets require the use of a breathable membrane beneath. How Easy Are Metal Sheets to Fit? Metal roofing sheets are considerably easier to fit than traditional tiles. Unlike some alternative roofing sheets, however, these can weigh between 10kg - 15kg per square meter. We therefore recommend having somebody alongside you when fitting these roof sheets. What is the Minimum Pitch for Metal Sheet Roofing? Metal roofing sheets are suitable on pitched as low as 5 degrees, although you may need to alter the overlap to accomodate this. These roofing sheets can also be fitted on angles as high as 90 degrees. This makes them suitable for most cladding applications too. If you have more questions about our metal roofing sheets, speak to our team online or by telephone. With over 40 years of experience in roofing, we'll help answer your questions and will ensure you have everything you'll need to complete your roofing project.